Daniel C. Negola, DVM (“Dr. Negola”) began his veterinary career in Silver Spring, MD in 1972 working for Norbeck Animal Clinic. Two years later Dr. Negola opened his own veterinary practice at 601 South Stonestreet Avenue, Rockville, calling it North Rockville Veterinary Hospital. After a very few years, the business outgrew the facility, and the hospital moved to a brand-new hospital at 1390 East Gude Drive, Rockville, MD. That building was designed by an architect specializing in veterinary hospitals and closely followed the American Animal Hospital Association’s (“AAHA”) guidelines. The practice moved into the new facility in August, 1980 with the capacity to care for 70 medical and surgical small animal patients. In May 1982 the Gude Drive hospital was certified by AAHA. In March, 1983,the magazine Veterinary Economics awarded Dr. Negola the 1982 HOSPITAL OF THE YEAR AWARD for excellence in architecture and design for the Gude Drive building. In 1984 Dr. Negola became a Diplomate, American Board of Veterinary Practitioners Certified in Canine and Feline Practice when he passed their specialty board examination. In 1993, again in 2004, and again in 2014, Dr. Negola was recertified in Canine and Feline Practice by the American Board of Veterinary Practitioners. Dr. Negola has a special interest in orthopedics and has taken numerous courses in this discipline including the Eighth and Tenth Annual Basic Course and Second Annual Advanced Course of Internal Fixation of Fractures, Non-Unions, and Reconstruction Surgery in Small Animals, Fawcett Center for Tomorrow, at Ohio State University. Dr. Negola enjoys taking classes of continuing education, and since 1974, has received recognition for attending more than 50 hours of class each year. In July, 1989 the local community voted Dr. Negola the Best Suburban Veterinarian as recognized by the Washingtonian Magazine. That same year he was named “Alumni of the Year” by Tuskegee University. Throughout his career Dr. Negola has been involved in community services having served on the Montgomery County Animal Control Task Force and continues to work with the Montgomery County Humane Society, the Montgomery County SPCA, Animal Advocates of Howard County, Animal Welfare Society of Howard County, and various other rescue groups. He is a member of several professional groups for whom he has been a speaker. He has also spoken to various breed clubs and has been active with children’s groups. In 1996 Dr. Negola sold the Gude Drive practice to a national corporation. After working for the new owners for two years, Dr. Negola opened Negola’s Ark Veterinary Hospital in Gaithersburg. 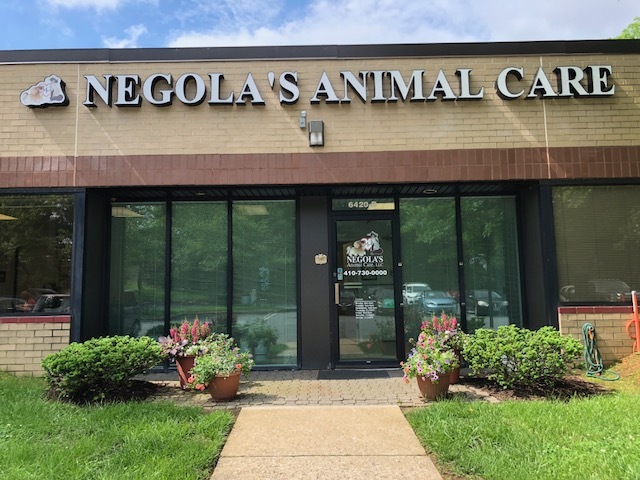 After selling this Gaithersburg practice to another veterinarian corporation, and working for these new owners for two years, he opened the present practice, Negola’s Animal Care, LLC, in Columbia, MD in 2017.